Looking over these parts last evening I realized they need a date badly so will put the day and date at the top from now on. Heavy frost last night. All the vehicles were white with a nice sunny morning. Sad news indeed. Joe claims I managed 10.99 MPG on those fuel figures and claims I should be up around 20 MPG with this rig. K & J had her fine tuned and I would hate to touch her. If I did anything to it I would need a tanker truck running alongside to keep it going. Thanks Joe but I am not touching it. There was an orange tree with one orange on it next to the trailer next door and this is a photo of that tree. The bright yellow spot is the location of the one orange. You will have to take my word for it because we do not see it in the photo. We got ready and departed the Orange Grove Campground at 0932. The campground is so old there was no way to dump the tanks so we took off without dumping. How in the world that campground rates a Good Sam rating is beyond us. Some money must have changed hands under the table for that one but what the heck, they gave us our Good Sam percentage off or claim they did. All that keeps it going is Disney World we are sure. Our new GPS took us right out of Kissimmee and we had good highway north. We took the Florida turnpike north for $12.00 until it joined with interstate 75. 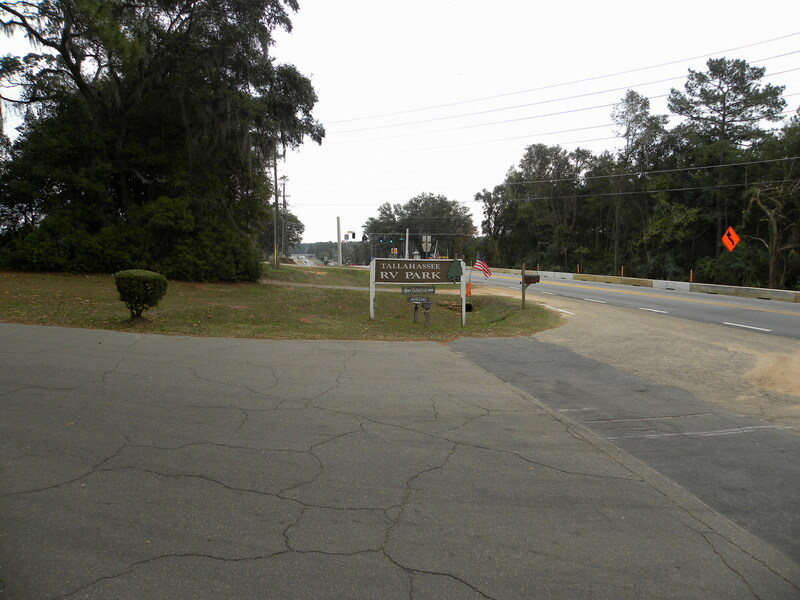 We went on interstate 75 north until it connected with interstate 10. We cancelled the Zephyr Hills portion of the trip. One of those we camp with in the summer has a park model at Evangeline Beach and another park model at Zephyr Hills. They spend their summers north and their winters south. He was telling me there are 120 campgrounds in the Zephyr Hills area but none are there for the tourist with things to do, etc., at the campground. It is up to one to find their entertainment off the campground. 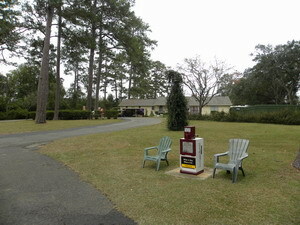 It was sunny and the temperature was 49F when we left Kissimmee and we drove steady to Lloyd, Florida, where we pulled in for $93.00 of diesel. That was a steady run of 411 kilometres but we did not mind it until we got out to get the fuel. There we decided to see about calling it a day. 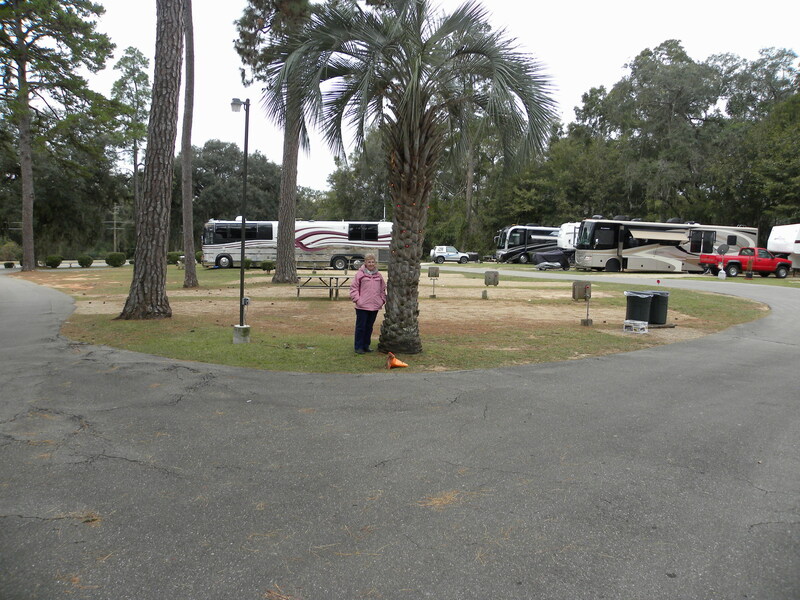 We found the Tallahassee RV Park in the Good Sam campground directory and said that is it. It was just 17 kilometres down the road on interstate 10 and here we are. Cheaper and much better than Kissimmee by a long shot. The first thing we did was dump the tanks when hooking up. It was overcast and the temperature 43F when we pulled in for the day at 1427. This gave us a total of 428 kilometres for the day. 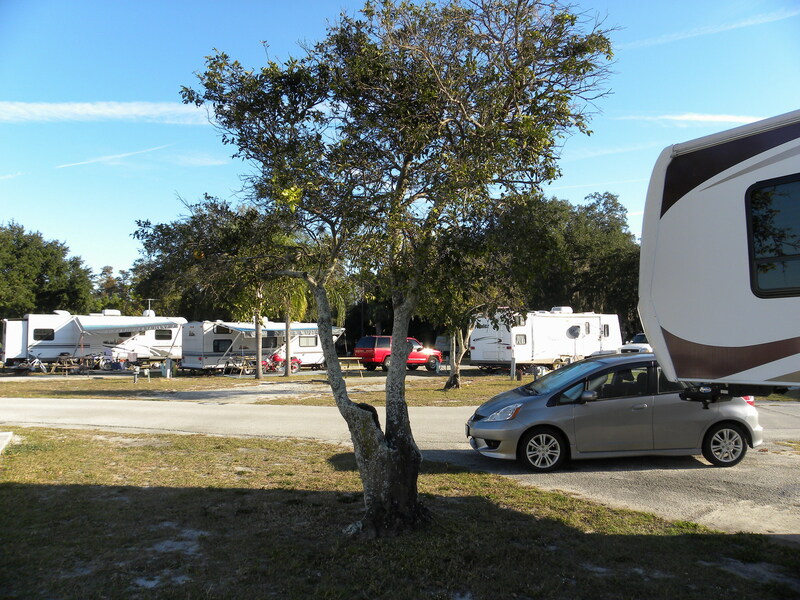 We had a note from Bob, WA5AWC, before leaving Kissimmee stating the temperature there had been 26F or -4C so it will be awhile before we get some warm weather. 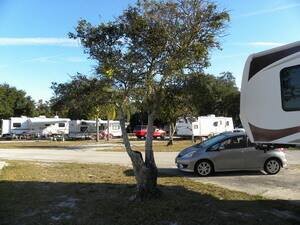 This campground is so much nicer we had to wander around and take some photographs as soon as we had the trailer blocked up and set-up for the night. There is always some construction taking place it seems, that they call road work around here. 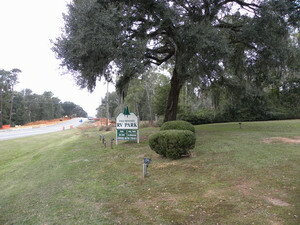 This is the view from both sides of the main entrance to the campground. This is the front and the back of the office. 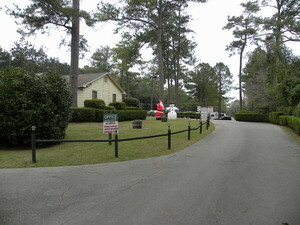 The office is at the back as you come up the entrance to the campground. They are getting ready for Christmas with both Santa and Frosty guarding the front gate. 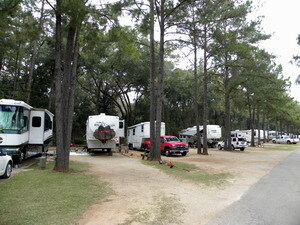 This is the truck sitting in among the trees with a multitude of other units and some are very nice motor homes. Note the size of the trees. There are a lot of those squirrels with the bushy tails around. I'll have to try and get a photo of one at least. Note the Canadian flag on the front of the fifth wheel next to us. That trailer is from Ontario but we have seen no one around it. Maybe they left their trailer here and drove to Disney World. 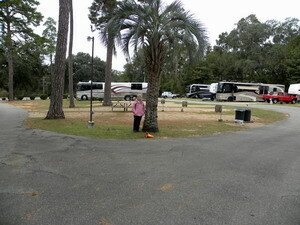 There is a palm tree next to the entrance way as one comes up to the office. It is decorated with flashing Christmas lights and I had to take two photographs only to get one with the lights on. It is still parka weather believe me. Before CB radio trucks communicated a lot with their lights. There was an old B series Mack out west 45 years ago that used to flash his clearance lights across the roof of his cab in sequence. He flashed them across two or three times and then left the second one in only flashing two or three times and then put them all back on steady. It was his way of telling those he met at night who he was. They had white back up lights mounted on top of their west coast mirrors back then and used to flash a thank you to a good buddy who gave them a break when they went around someone. When we took delivery of this trailer I was thinking it would be nice to be able to flash those two back up white lights on the trailer for the same reason. No one has back up lights on their mirrors today. They have a completely different mirror. But they still flash a thank you. We had a beautiful Pete from Iowa go past us today. He was navy blue with lots of chrome, wheels, bumpers and so on. The back door to his trailer was chrome and the bottoms of his mud flaps were also chrome. One beautiful 18-wheeler and the trucks here are 18 wheels. We have not seen a triple axle trailer here in Florida, at least not one we remember. When this Pete rolled by today I flashed him in and he flashed a thanks with every light on the back of his rig. There were so many red lights it looked like a Christmas tree. A great feeling and as you can tell I'm still a kid at heart. This is it for today. I had been keeping a written diary up until now. We seldom read it but have it in the form of 13 notebooks. The notebook is taking a back seat to this. This has become more or less a running diary and we will print it when we get back home to save with the 13 notebooks.